← It’s simple — teach the 6 virtues! The Six Virtues of the Educated Person by J. Casey Hurley brings to light and articulates many points that need to be discussed in education today. The most important is the need for schools to operate from a core belief system that focuses the school system on educational ends instead of political ends. Dr. Hurley presents the view that if educators focus on what it means to be educated then students will be prepared to accept their role and be a part of a democratic citizenry. This outcome represents one of the original intents of our public education structure. By outlining and defining the six virtues of the educated person: understanding, imagination, strong character, courage, humility, and generosity and by requiring educators to model these virtues, he brings an important view of leadership and pedagogy to education today. Education in the 21st century has been high jacked by politics and standardization. When Thomas Friedman in his book The World is Flat describes the importance of curiosity and CQ (curiosity quotient) as opposed to IQ for the 21st century student, he is speaking the same language as Dr. Hurley. To be educated, according to Hurley, does not solely entail success on standardized tests, it also includes a courageous willingness to look deeply into yourself, to display generosity toward your fellow human beings, to be humble for all that you have received in life. Hurley’s view is that if we discuss these virtues fully in our schools, if we model this virtuous behavior, then good test scores will come and students who graduate from our public schools will become educated members of a democratic society. On the other hand, if we continue to follow the current path in education we will be driven by each political whim that comes along and subject to each election cycle. Hurley’s book exposes this politically driven type of thinking and suggests that we break from this collective psychology in education which forces educators to react and change gears during each election cycle and lose hope that true change can occur at all. Another underlying theme in the book relates to democratic governance as the core belief of the educational model. When we are consistently focused on core beliefs as the driving force behind what we do we are less likely to be reactive to political and bureaucratic forces. Hurley effectively argues that democratic governance does not necessarily tie to a liberated or energized student body or faculty that models the six virtues. The point about democratic governance is made to demonstrate that popular vote does not always get you good results in education. When reading the book I thought of Plessy v. Ferguson, segregation, and the need for the Civil Rights Act of 1964 as an enduring example of how democratic governance had not provided for individual liberty for many of our citizens. Dr. Hurley has written a book that should liberate both students and teachers. By focusing on the six virtues, he gets at the core of what our education system should be about; that is, the complete education of our future citizens. The book is revolutionary because it offers a different view of where to begin with public education. By proposing that the study of virtues, and the modeling of virtue on the part of educators, will lead to an educated student who will not only be proficient on standardized testing, but who will treat others with kindness, generosity, and caring. This is an important vision for public education that will resonate with teachers who understand that a definition of educational success does not always equate to test scores. Below the surface, educators will agree with Hurley’s premise that the six virtues should be at the core of what we do in education. 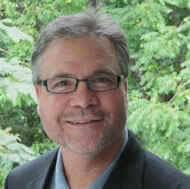 Will Hoffman is an associate superintendent in Madison County Schools, North Carolina; and a doctoral student in Western Carolina University’s educational leadership program. 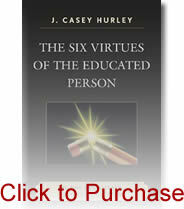 “The Six Virtues of an Educated Person” by J. Casey Hurley, is an extremely informative, and eye-opening expose on the social and political factors that impede progressive reform in the public education system. The book opens our eyes to the ways in which our insistence on incorporating democracy into the education system greatly contributes to, and is perhaps the root cause of our challenges and failures. In discussing the power and influence public officials wield over educational policy, Hurley illustrates how the education system is destabilized by the shifting winds of political discourse and controversy. The political influence on the school directly impacts the core elements of the school system from its stated purpose, and delivery methods, to its assessment and definition of success. Hurley also identifies and discusses the virtues he believes form an educated person and skillfully weaves them into an alternative model for the education system in which the cultivation of these virtues becomes the purpose of the educational system, as well as the driving force behind the community and aesthetic based approaches to institutional assessment, and improvement. Before I read Dr. Hurley’s book, I wondered how the six virtues could be incorporated in our schools. I have to admit, that after I finished reading the book, I was still wondering the same thing. However, there were so many times during the reading of the book that I wanted to stand up and cheer. For example, Hurley’s discussion of the social science paradigm made me want to say “Amen!” I am so tired of people saying teachers need to use “research-based” interventions and strategies in their classrooms. When did teaching become a science? When did we lose our heart? In public schools we are so focused on data, that we have lost sight of the kids. We are so busy looking at testing data and trying to figure out how to help kids “grow” in testing terms, that we focus only on strategies that research says will help students become “proficient.” We have lost sight of the art of teaching. We have lost sight of our purpose for education, which is NOT to help all kids pass tests! What does it mean to be educated? Our state, and 46 others, would say that it is mastery of common core standards as evidenced by proficiency on assessments. Hurley says it is the attainment of the six virtues. However, we are so afraid of this because there is no data out there to show us they have attained it. Goals must be measurable, right? (SMART goals) How do we measure humility? What data would drive our instruction (data-driven instruction)? We have become so obsessed with data and the scientific approach to teaching and learning to the point where we have lost focus on what truly matters. So, I’m back to my original question? How do I incorporate the six virtues into my school? I guess I need to do what many good teachers do. They listen and politely nod when given directives about new strategies, data and programs. Then they go into their classrooms, shut the door and teach the way they know is best for student learning to occur. They focus on the children and their needs. They model the six virtues. That is what I need to do in my little rebellion! I will sit in meetings, smile and nod, and then go back to my school and do what is best for kids, all the while hoping I don’t get fired! Amy Jones is Principal of Crest Middle School, Cleveland County, North Carolina; and a doctoral student in Western Carolina University’s educational leadership program.